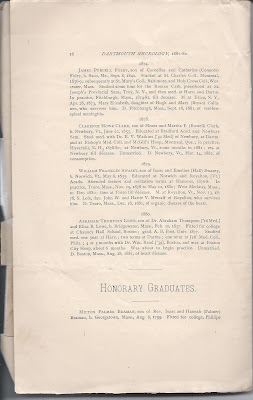 Obituary Record of the Graduates of Dartmouth College and the Associated Institutions for the Year Ending at Commencement, 1882. Each short bio is transcribed, but not word for word. If you notice any errors, ether in the information provided in the text or in transcription, please leave a comment or contact me directly. Isaac Patterson, son of Isaac and Elizabeth (Wadsworth) Patterson, b. Piermont, New Hampshire, January 28, 1792. Principal at Haverhill (New Hampshire) Academy, 1 812-13. 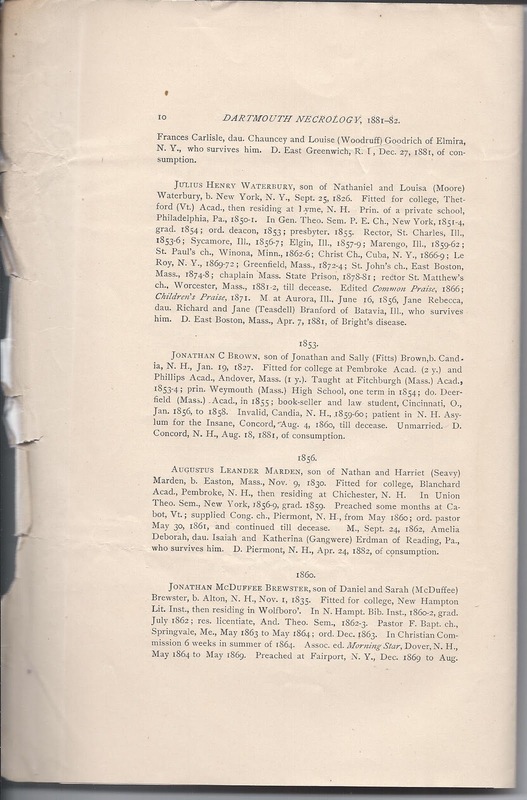 Read law with John Russell, Troy, New York, and Joseph Bell ('07), Haverhill, New Hampshire; in practice, Lyme, New Hampshire September 1817, to March 1819; Bath, New Hampshire to Feb. 1880; retired to Piermont, New Hampshire till decease. Member legislature 1831-3-4; town clerk of Bath, 1839-79. Unmarried. Died at Piermont, New Hampshire January 14, 1882. Edmund Carleton, son of Dr. Edmund ('03 Med.) and Joanna (Coffin) Carleton, born Haverhill, New Hampshire October 29, 1797. Fitted for college, Haverhill Academy. 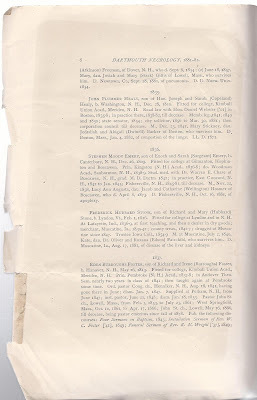 Taught at Tappahannock, Essex Co., Virginia, from fall of 1822, and read law there with William Garnett; admitted to Virginia bar January 25, 1826. Read law with Joseph Bell ('07), Haverhill, New Hampshire, one year from spring of 1826; admitted to New Hampshire bar May 1827; in practice at Littleton, New Hampshire from 1827; also engaged in lumber manufacturing at Littleton, some years from 1833. Was a prominent anti-slavery man, and a Free-soil candidate for Congress. Married November 30, 1826, to Mary Kilburn, daughter of Thomas and Hannah (Kilburn) Coffin of Boscawen, New Hampshire, who died March 19, 1880. Edmund Carleton died at Littleton, New Hampshire March 11, 1882 of old age and bronchitis. Wakefield Gale, son of Joseph and Susannah (Frye) Gale; born Pembroke, New Hampshire January 18, 1797. Fitted for college at Phillips Academy, Andover, Massachusetts. In Andover Theological Seminary 1822-1825. Acting pastor Congregational church at Eastport, Maine, from October 1825; ordained there May 17, 1826, and installed February 19, 1829; dismissed November 24, 1835. Installed pastor at Rockport, Massachusetts May 4, 1836; dismissed February 10, 1864. Resided at Easthampton, Massachusetts 1866 until decease. Acting pastor at West Granville, Massachusetts 1867-1870. Pub. The Soul Returning unto its Rest, a sermon, 1840; Sermon on the Death of Deacon Isaac Patch, 1862. Married (1) September 1828, Mary Louisa, daughter of Asa and Lydia (Newton) Bigelow of Colchester, Connecticut, who died April 12, 1861; (2) August 5, 1865, Mrs. Minerva (Graves) Coleman, daughter of Elnathan and Lydia (Pomeroy) Graves of Easthampton, Massachusetts, and widow of Eleazar Coleman; she died November 10, 1878; (3) August 31, 1879, Mrs. Marantha (Dyer) Hall, daughter of Bela and Deborah (White) Dyer of Plainfield, Massachusetts, and widow of Sylvester S. Hall. She survives Rev. Gale, who died at Easthampton, Massachusetts on October 3, 1881, of dysentery. Allen Gannett, son of Matthew and Priscilla (Hayford) Gannett, b. Tamworth, New Hampshire on June 4, 1805. In Andover Theological Seminary 1829-1831. Acting pastor Congregational Church, Conway, New Hampshire, from 1834; ordained there January 20, 1836; dismissed June 22, 1838. Resided Boston, Massachusetts 1838-1840; acting pastor, West Granville, Massachusetts, 1840; do Edgartown, Massachusetts 1841-43; taught some time at Georgetown, Massachusetts and edited the Watch Tower; pastor, North Beverly, Massachusetts, December 16, 1847 to April 26, 1853; supplied Independent church, Nahant, Massachusetts 1853-1858; 2d church, Lynnfield, Massachusetts 1858-1865; teacher in Boston, 1865-71; resided Edgartown, Massachusetts, 1871-81, till decease. 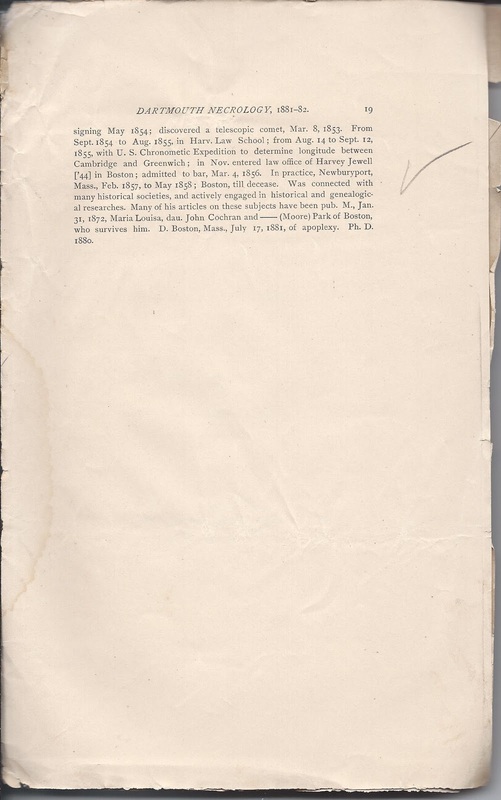 Married August 9, 1870, Mrs. Ann Eliza (Mayhew) Osborn, daughter of Theodore G. and Eliza (Ross) Mayhew of Edgartown and widow of Abraham Osborn; she survives him. He died at Edgartown, Massachusetts on October 16, 1881, of heart disease. Henry Little, son of Jesse and Martha (Gerrish) Little, born at Boscawen, New Hampshire on March 23, 1800. In Andover Theological Seminary 1826-29, graduated 1929; ordained to Congregational ministry at Boston, Massachusetts, September 24, 1829. Agent American Educational Society 1829-31, 18 months; pastor Presbyterian church at Oxford, Ohio, June 1831 to 1833; agent American Home Missionary Society for Western States, Cincinnati, Ohio, 1833-1838; pastor 2nd Presbyterian church, Madison, Indiana, from October 1838 a year and a half; again agent American Home Missionary Society at Madison, 1840-61; dist. sec. Presbyterian Com. Home Miss., New School, 1861-69; do Presb. Board Home Miss., 1869-1882, till decease. Married September 19, 1831, Susan Norton, daughter of Obadiah and Susannah (Norton) Smith of Hatfield, Massachusetts; she survives him. He died at Madison, Indiana on February 25, 1882, of cancer of the face. D. D. Wabash College 1867. Milo Parker Jewett, son of Dr. Calvin ('21 Med) and Sally (Parker) Jewett, born at St. Johnsbury, Vermont on April 27, 1808. Fitted for college at Bradford (Vermont) Academy. Principal at Holmes Academy, Plymouth, New Hampshire, 1828-29; read law meanwhile, and until summer of 1830. In Andover Theological Seminary 1830-33. Professor in Teacher's Dept, Marietta College, Ohio, 1833-35. Professor of Rhetoric and Pol. Econ. do, 1835-1838; principal Judson Female Institute at Marion, Alabama, January 1839 to 1855; ordained to Baptist ministry at Marion, June 26, 1842; while there published Alabama Baptist; principal at Cottage Hill Seminary, Poughkeepsie, New York 1856-61; president of Vassar College, Poughkeepsie, New York, 1861-64; retired, Poughkeepsie 1864-67; Milwaukee, Wisconsin 1867-82, till decease. Commissioner Public Education, Milwaukee; chairman board of visitors, University of Wisconsin; President of Wisconsin State Temperance Society; Published Jewett on Baptism, 1840; Report of the President's Visit to Europe, 1863; Report on the Organization of Vassar College, 1863; Relations of Boards of Health to Intemperance, 1874; A Plea for Academics, 1874; The Baptist Centennial, 1875; The Model Academy, 1875. Married in 1833 to Jane Augusta, daughter of Moore Russell of Plymouth, New Hampshire. Died at Milwaukee, Wisconsin June 9, 1882 of pneumonia. L.L.D. Roch. Univ. 1861. William Henry Green, son of Samuel and Fanny (Harwood) Green, born at Shrewsbury, Massachusetts August 31, 1812. Fitted for college at Ashfield (Massachusetts) Academy. Taught at Skaneateles, New York, and read law there with Lewis H. Sanford, 1830-38; practiced at Buffalo, New York October 1838 till decease. Married October 7, 1845 to Catherine T., daughter of William Bull of Wallkill, New York; she survives him. He died at Buffalo, New York in April of 1882. Sullivan Carverno, son of Jeremiah and Margaret (Brewster) Caverno, born at Strafford, New Hampshire on March 21, 1807. Fitted for college at Philips Exeter Academy. Taught at Brockport, New York, 1831; principal at Lewiston (New York) Academy 1832-33. Studied law with Hiram Gardner at Lockport, New York 1833-35; admitted to bar October 1835; practiced there till decease. 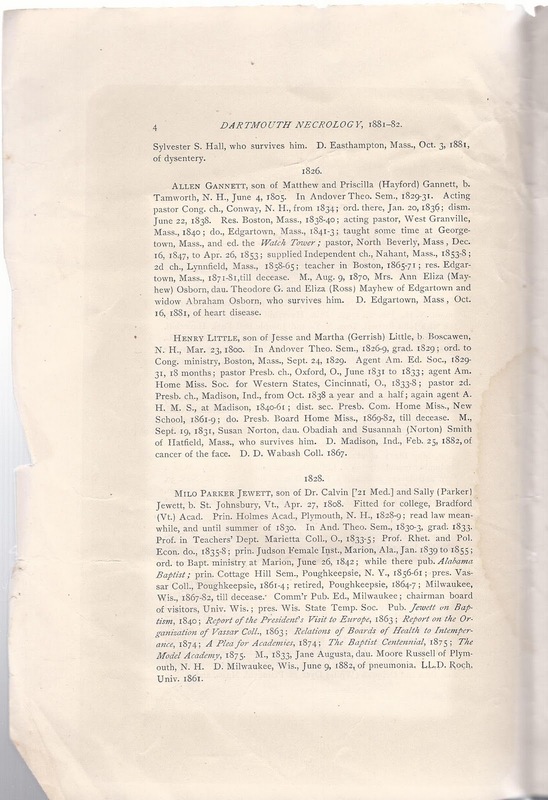 Master and examiner in chancery, from January 1836 four years; police justice Niagara County 1844-48; commissioner to revise the statutes of New York, 1875. Married December 10, 1835 to Martha Elizabeth, daughter of Thomas Kelsey of Lewiston; she survives him. He died at Lockport, New York on February 2, 1882 of paralysis. Daniel Ford Richardson, son of David and Sarah Goodwin (Ford) Richardson; born at Cornish, New Hampshire on August 16, 1807. Fitted for college at Kimball Union Academy, Meriden, New Hampshire. In Andover Theological Seminary 1831-34; preached at Georgetown, Massachusetts, and at Broome St. Baptist Church, New York, 1834-36. Traveled through the United States, 1837; Profesor Ancient Languages at Wake Forest College, North Carolina, 1837-43. Ordained to Baptist ministry, Wake Forest, North Carolina, April 8, 1838; while there preached extensively to North Carolina and Virginia; pastor, Cavendish, Vermont, 1843-45; Greenville, New Hampshire, 1845-48; Hanover Center, New Hampshire, 1848-53; Meriden, New Hampshire1853-58; West Plainfield, New Hampshire 1858-63; resided at Hanover from 1853. Member constitutional convention, 1850; member of legislature 1850 and 1851; postmaster at Hanover, 1853-58; treasurer of Darmouth Savings Bank, October 23, 1860 to January 9, 1866. Unmarried. Died at Hanover, New Hampshire on February 7, 1882 of paralysis. Newton Epaphroditus Marble, son of John G. and Elizabeth (Parker) Marble, born at Bradford, Massachusetts on September 1, 1808. Fitted for college at Bradford Academy, under Benjamin Greenleaf, ['13]. Principal at Hampton (New Hampshire) Academy 1834-35; do. Franklin Academy at Dover, New Hampshire, 1835-1838; Inst. Math and Nat Phil, Peterburgh (Virginia) Classical Institute 1838-40; princ. do February to August 1840. Studied law while teaching. In Gen. Theological Seminary Protestant Episcopal Church, New York, 1840-41; then in Philadelphia. Ordained deacon at Boston, Massachusetts on September 7, 1843; presbyter December 4, 1844. Rector Trinity Church, Bridgewater, Massachusetts, September 1843 to May 1845; do. Christ Church, Salmon Falls, New Hampshire, to March 1, 1846. Principal Taunton (Massachusetts) Classical School, to February 1848. Rector St. Paul's Church, Concord, New Hampshire, to April 1, 1857; do Trinity Church, Newtown, Connecticut, April 5, 1857, to September 1, 1878; resided at Newtown till decease. Chaplain at the New Hampshire Legislature, 1855. Published several sermons. Married (1) April 6, 1847, Sarah Huntington, daughter of Asa ('10) and Frances (Atkinson) Freeman, of Dover, New Hampshire, who died September 6, 1854; (2) June 18, 1857, Mary, daughter of Josiah and Mary (Stark) Gillis of Lowell, Masachusetts, who survives him. He died at Newtown, Connecticut on September 28, 1881, of pneumonia. D. D. Norwich University, 1854. John Plummer Healy, son of Hon. Joseph and Sarah (Copeland) Healy, born at Washington, New Hampshire on December 28, 1810. Fitted for college at Kimball Union Academy at Meriden, New Hampshire. Read law with Hon. Daniel Webster ('01) in Boston, 1835-38; in practice there, 1838-1882, till decease. Member of legislature 1841, 1849 and 1850; state senator; 1854; city solicitor 1856 to March 30, 1881; then corporation council till decease. Married December 23, 1847, Mary Stickney, daughter of Jedediah and Abigail (Dwinell) Barker of Boston; she survives him. He died at Boston, Massachusetts on January 4, 1882, of congestion of the lungs. LL.D. 1871. Stephen Moody Emery, son of Enoch and Sarah (Sargeant) Emery, born at Canterbury, New Hampshire on December 26, 1809. Fitted for college at Gilmanton, Hopkinton and Boscawen. Principal at Kingston (New Hampshire) Academy 1836-38; do Woodman Academy, Sanbornton, New Hampshire, 1838-39. 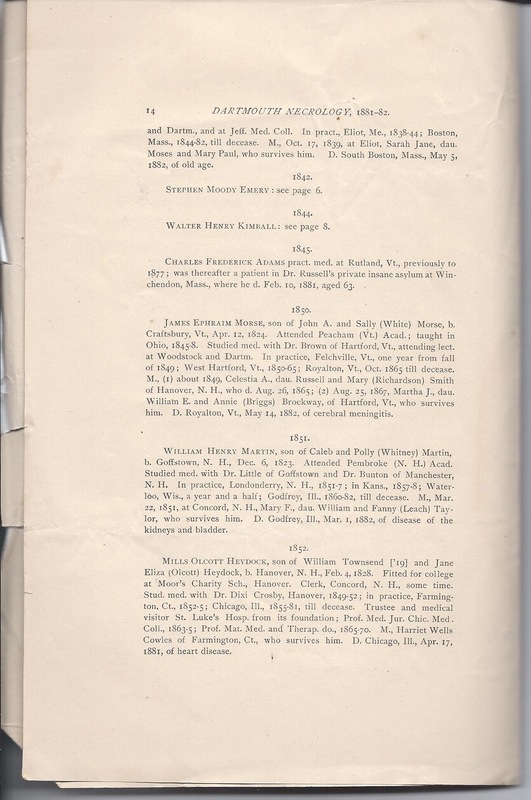 Studied medicine with Dr. Warren E. Chase of Boscawen, New Hampshire; graduated M. D. Dartmouth in 1842; in practice at East Concord, New Hampshire 1842 to January 1845; Fishersville, New Hampshire 1845-81, till decease. Married November 22, 1838, Lucy Ann Augusta, daughter of Jacob and Catharine (Wellington) Hosmer of Boscawen; she died April 8, 1873. He died at Fishersville, New Hampshire on October 16, 1881, of apoplexy. Frederick Hubbard Stone, son of Richard and Mary (Hubbard) Stone, born at Lyndon, Vermont on February 1, 1816. Fitted for college at Lyndon and in New Hampshire. At Lafayette, Indiana 1836-39, at first teaching, and then a dealer in dry goods; merchant, Muscatine, Iowa 1839-1842; county treasurer 1842-1847; druggist at Muscatine since 1847. Trustee Iowa College, 1854-59. Married at Muscatine, July 2, 1840, Kate, daughter of Dr. Oliver and Roxana (Edson) Fairchild; she survives him. He died at Muscatine, Iowa on August 17, 1881, of disease of the liver and kidneys. Eben Burroughs Foster, son of Richard and Irene (Burroughs) Foster, born at Hanover, New Hampshire on May 26, 1813. Fitted for college at Kimball Union Academy at Meriden, New Hampshire. Principal at Pembroke (New Hampshire) Academy 1837-38; in Andover Theological Seminary nearly two years in Class of 1841; then taught again at Pembroke some time. Ordained pastor at Congregational Church at Henniker, New Hampshire on August 18, 1841, having gone there in June; dismissed January 7, 1847. Supplied at Pelham, New Hampshire, from June 1847; installed pastor June 21, 1848; dismissed January 18, 1853. Pastor John St. Church at Lowell, Massachusetts from February 3, 1853 to July 23, 1861; West Springfield, Massachusetts October 10, 1861, to April 17, 1866; John St. Church, at Lowell, May 16, 1866, till decease, being pastor emeritus since fall of 1878. Pub. the following discourses: Four Sermons on Baptism, 1843; Installation Sermon of Rev. 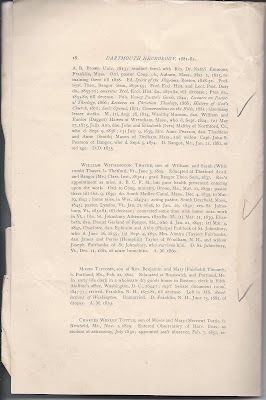 W. C. Foster ['41], 1849; Funeral Sermon of Rev. 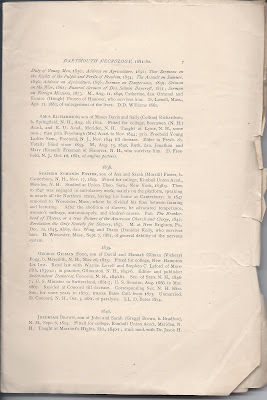 R. N. Wright ['37], 1849; Duty of Young Men, 1850; Address on Agriculture, 1851; Two Sermons on the Rights of the Pulpit and Perils of Freedom, 1854; The Assault on Sumner, 1856; Address on Agriculture, 1856; Sermon on Temperance, 1859; Sermon on the War, 1862; Funeral Sermon of Dea. 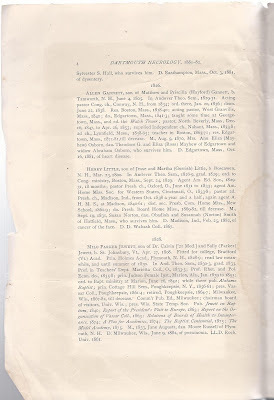 Selwin Bancroft, 1871; Sermon on Foreign Missions, 1873. Married August 11, 1840 to Catherine, daughter of Orramel and Eunice (Hough) Pinneo of Hanover; she survives him. He died at Lowell, Massachusetts, April 11, 1882, of enlargement of the liver. D.D. Williams, 1861. Amos Richardson, son of Moses Davis and Sally (Collins) Richardson, born at Springfield, New Hampshire on August 28, 1812. Fitted for college at Boscawen (New Hampshire) Academy, and Kimball Union Academy at Meriden, New Hampshire. Taught at Lyme, New Hampshire, some mos; then principal at Fryeburg (Maine) Academy to Nov. 1844; principal at Freehold Young Ladies Seminary, Freehold, New Jersey, Nov. 1844 till decease. Elder in Presbyterian Church. Totally blind since 1855. Married August 25, 1840, Ruth, daughter of Jonathan and Mary (Russell) Freeman of Hanover, New Hampshire; she survives him. He died at Freehold, New Jersey on October 16, 1881, of angina pectoris. Stephen Symonds Foster, son of Asa and Sarah (Morrill) Foster, born at Canterbury, New Hampshire on November 17, 1809. Fitted for college at Kimball Union Academy, Meriden, New Hampshire. Studied at Union Theological Seminary, New York, 1838-39. Then to 1847 was engaged in anti-slavery work, mainly on the platform, speaking in nearly all the Northern states, having his home at Canterbury; in 1847 removed to Worcester, Massachusetts, where he divided his time between farming and lecturing. After the abolition of slavery, he advocated temperance, woman's suffrage, anti-monopoly, and kindred causes. Pub. The Brotherhood of Thieves, or a true Picture of the American Church and Clergy, 1842; Revolution the Only Remedy for Slavery, 1857. Married at New Brighton, Pennsylvania, on December 20, 1845, Abby, daughter of Wing and Diana (Daniels) Kelly' she survives him. He died at Worcester, Massachusetts, September 7, 1881, of general debility of the nervous system. George Gilman Fogg, son of David and Hannah Gilman (Vickery) Fogg, born at Meredith, New Hampshire, on May 26, 1813. Fitted for college at New Hampton Literary Institute. 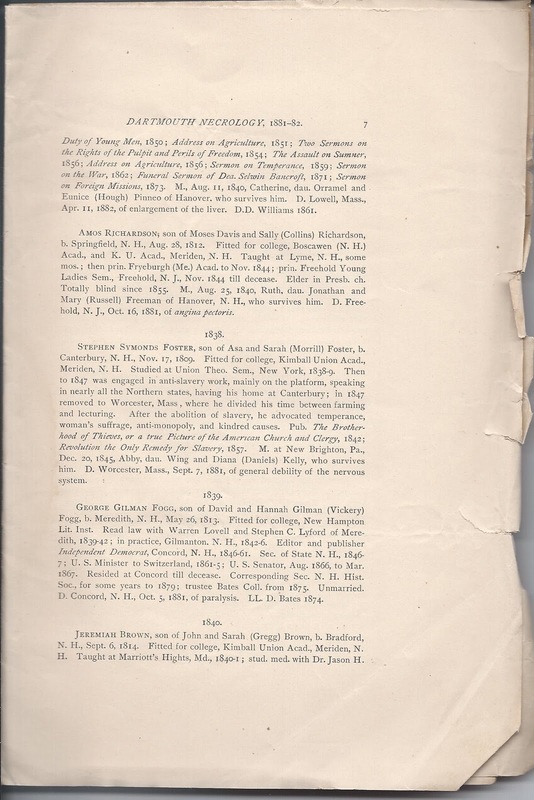 Read law with Warren Lovell and Stephen C. Lyford of Meredith, 1839-42; in practice at Gilmanton, New Hampshire 1842-46. Editor and publisher of Independent Democrat, Concord, New Hampshire 1846-61. Secretary of State of New Hampshire 1846-1847; U. S. Minister to Switzerland 1861-65; U. S. Senator, August 1866 to March 1867. Resided at Concord till decease. Corresponding Sec. 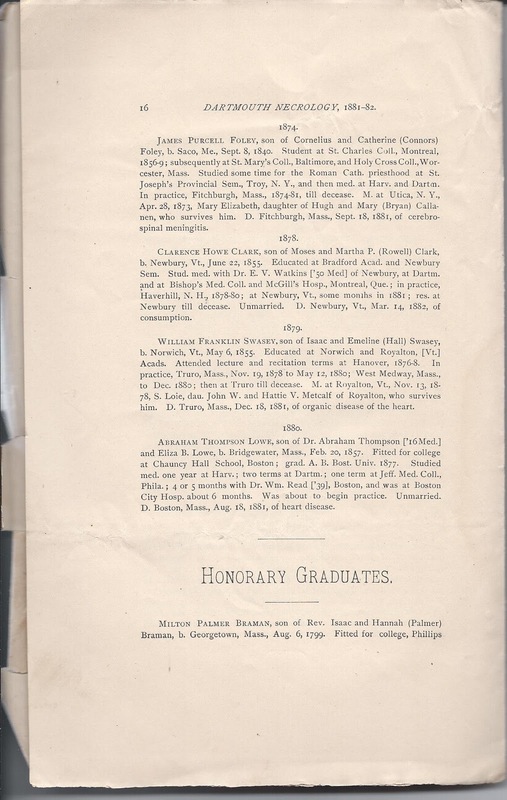 for New Hampshire Historical Society for some years, to 1879; trustee Bates College from 1875. Unmarried. Died at Concord, New Hampshire on October 5, 1881 of paralysis. LL.D. Bates College 1874. Jeremiah Brown, son of John and Sarah (Gregg) Brown, born at Bradford, New Hampshire, September 6, 1814. Fitted for college at Kimball Union Academy at Meriden, New Hampshire. Taught at Marriott's Hights, Maryland, 1840-41; studied medicine with Dr. Jason H. Ames of Bradford, 1841-42. 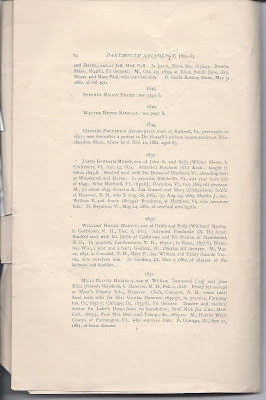 Read law with Mason W. Tappan of Bradford 1843-46 and with Ezra Wilkinson of Dedham, Massachusetts 1846; admitted to bar at Dedham, December 24, 1846; in practice there, 1846-48; in Boston, 1848-1881, till decease. Married in Boston, October 30, 1870, Mrs. Mary H. Talbot, daughter of Richard and Margaret Mitchell and widow of Rev. Samuel Talbot; she died September 18, 1872. He died at Boston, Massachusetts on December 26, 1881 of inflammation of the bladder and kidneys. Samuel Prescott French, son of Dr. John and Lucy (Prescott) French, born at Gilmanton, New Hampshire on March 17, 1818. Fitted for college at Gilmanton Academy. Principal at Boscawen (New Hampshire) Academy, 1842; do Sandwich, New Hampshire, 1843. Studied medicine with Dr. Nahum Wight of Gilmanton, attending lectures at Darmouth, Berkshire Medical College and Harvard. M. D. Berkshire Medical College, 1844. In practice at South Merrimack, New Hampshire 1845; Richmond, New Hampshire, October 1845 to 1864; Winchester, New Hampshire, 1864-69; Warwick, Massachusetts 1869-81; Richmond, New Hampshire February 1881 till decease. 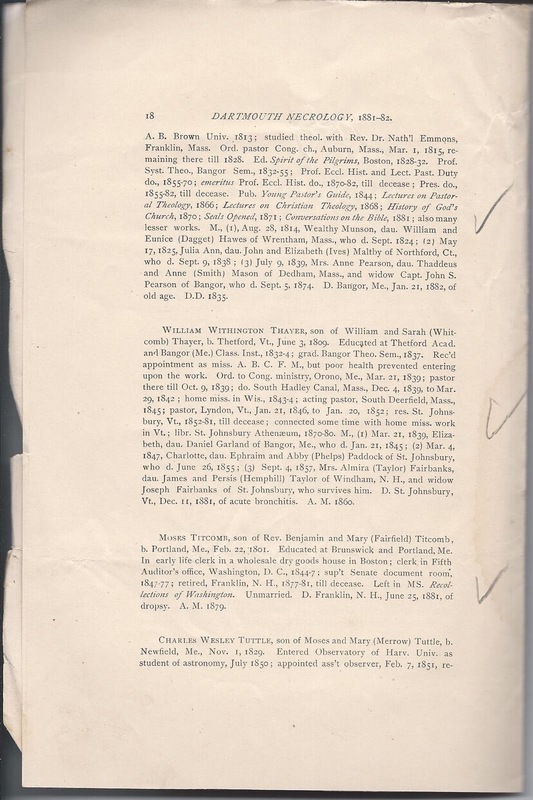 Member of Legislature 1855; superintending school committee in Winchester, Warwick and Richmond. Married December 3, 1849, Nancy Helen Mary, daughter of Abner and Nancy (Swan) Barden of Richmond; she survives him. He died at Richmond, New Hampshire February 7, 1882 of paralysis of the heart. Walter Henry Kimball, son of Amos and Lucy (Foster) Kimball, born at West Boxford, Massachusetts on June 20, 1820. Fitted for college at Franklin Academy, North Andover, Massachusetts. Studied medicine with Dr. Dixi Crosby, Hanover; graduated M. D. at Dartmouth 1844; in Marine Hospital at Chelsea, Massachusetts a short time. In practice at Andover, Massachusetts 1845-1881, till decease. Married at North Andover, Massachusetts August 11, 1846, Mary Elizabeth, daughter of John and Betsey (Tyler) Gage; she survives him. He died at Andover, Massachusetts September 30, 1881, of paralysis. John Riley Varney, son of James Bowdoin and Sarah Byles (Riley) Varney, born at Dover, New Hampshire, on March 26, 1819. Fitted for college at Gilmanton Academy and Franklin Academy, Dover. Taught in Franklin Acdemy 1843-45; civil engineer on various railroads in Massachusetts, New Hampshire, Vermont, Connecticut, Rhode Island, New York and Canada 1846-55. 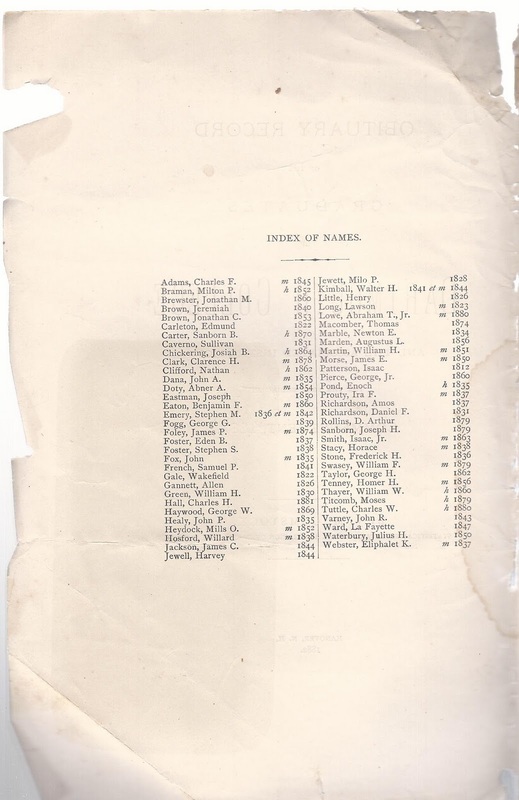 Clerk of courts, Strafford County, New Hampshire May 1856 to September 1860. Professor of Mathematics at Dartmouth College 1860-63; clerk Naval Com., U. S. Senate, winter of 1862-3. 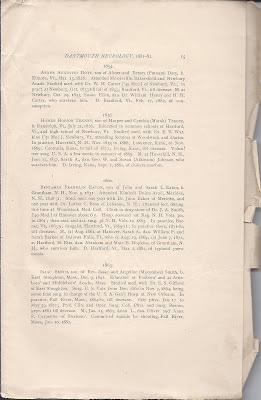 Read law with D. Blaisdell ['27] of Hanover and Richard Kimball of Dover; admitted to to Grafton County bar September 1863; practiced at Dover, March 1864 till decease. One of the editors and proprietors of Dover Enquirer 1868-1882, till decease. do. Daily Republican, 1881-82, till decease. Postmaster of Dover October 1, 1865 to 1870. 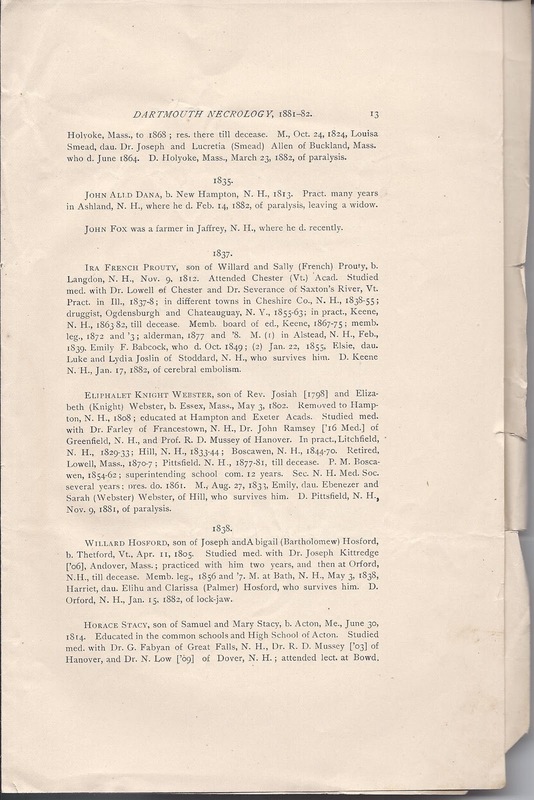 Member of Legislature 1856 and 1857; Register of Probate 1872-74, 1876-1882, till decease; selectman 1868-1869-1870-1871; member school committee 1877-8-9-80-81; police justice 1877-1882, till decease. Deacon First Congregational CHurch. Married (1) November 21, 1848, Susan Kittredge, daughter of Amos Kimball of West Boxford, Massachusetts, who died January 12, 1851; (2) December 25, 1860, Isabella Graham, daughter of Richard and Margaret J. (Pendexter) Kimball of Dover, who survives him. Killed by a falling building, Dover, New Hampshire, on May 2, 1882. James Corbin Jackson, son of Hon. Eleazar and Lois (Corbin) Jackson, born at Cornish, New Hampshire on August 2, 1818. Fitted for college at Kimball Union Academy at Meriden, New Hampshire. Studied medicine at Jefferson Medical College, Philadelphia; graduated M. D. 1847; in practice at Hartford, Connecticut 1847-1882, till decease. Held many positions of trust in the city and had been treasurer of the Connecticut Medical Association. Married (1) 1849, Mrs. Mary (Wing) Childs of Hartford, daughter of John and Elizabeth (Ormsbee) Wing, who died January 1877; (2) December 1878, Helen L., daughter of Sylvester S. and Lucinda (Gaylord) Lyman, who survives him. Died at Hartford, Connecticut on February 7, 1882 of typhoid pneumonia. Harvey Jewell, son of Pliny and Emily (Alexander) Jewell, born at Winchester, New Hampshire on May 26, 1820. Fitted for college at Keene, New Hampshire. Teacher in Mayhew School, Boston, a short time; studied law with Lyman Mason ['39] at Boston; in practice there October 1, 1847 till decease. Member common council 1851 and 1852; member legislature 1861-2-6-7-8-9-70-1; speaker 1868-9-70-1; Judge Court of Commissioners of Alabama Claims, 1875-77. Married December 26, 1849, Susan A., daughter of Richard and Elizabeth Bradley of Concord, New Hampshire, who survives him. Died at Boston, Massachusetts on December 8, 1881, of pneumonia. LL.D. 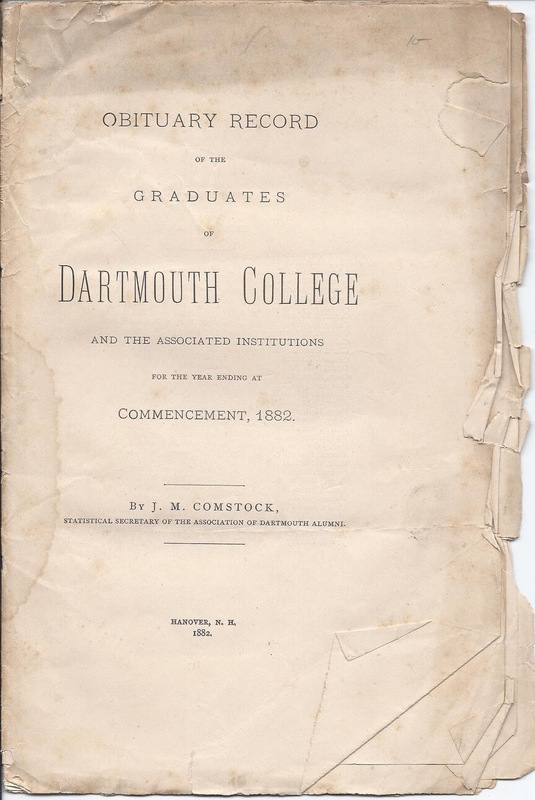 Dartmouth 1875 and Williams 1880. La Fayette Ward,son of Nathaniel and Cynthia (Clark) Ward, born at Wardsboro, Vermont on November 17, 1824. Fitted for college at Burr Seminary, Manchester, Vermont; Principal Saxton's River (Vermont) Seminary 1847-49; taught at Westminster, Vermont 1849-50; again at Saxton's River three years and a half; Principal at Powers Institute, Bernardston, Massachusetts, 1858-63; resided at Westminster 1863-66; Principal at Bellows Falls (Vermont) High School, winter of 1866-67 to fall of 1868; Principal at Powers Institute, Bernardston 1868-70; Superintendent of Schools at Northampton, Massachusetts June 1870 to June 1873; Principal at Bellow Falls High School, spring of 1874 to Fall of 1879; resided at Westminster 1879-1882, till decease. Member of Vermont Council of Censors, 1855; member of Legislature 1864; member Massachusetts Board of Education 1868-70. Married February 28, 1850, Emily Henrietta, daughter of Joseph and Jerusha Leach of Saxton's River, Vermont, who survives him. Died at Jacksonville, Florida on April 8, 1882 of acute bronchitis. Joseph Eastman, son of Samuel and Betsey (Page) Eastman, born at Sandown, New Hampshire, on March 9, 1826. Fitted for college at Kingston Academy and Phillips Exeter Academy. Principal of Kingston (New Hampshire) Academy 1850-53; do Exeter (New Hampshire) High School 1853-55. 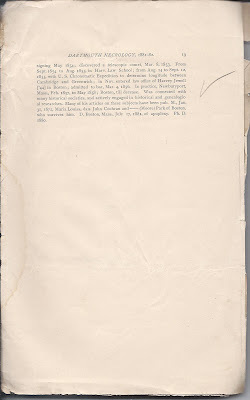 Studied law with Stickney and Tuck, Exeter; practiced at Haverhill, Massachusetts 1855-58. Principal at Barnard School at South Hampton, New Hampshire 1858-59; teacher of math at Greenwich Academy, East Greenwich, Rhode Island, from 1859 some years; then of the classics in the same school to November 1881. President of the Rhode Island Institute of Instruction, 1880. Married (1) August 4, 1859, Nyra, daughter of Stephen and Hannah (Bartlett) Kelly of Amesbury, Massachusetts, who died August 27, 1866; (2) Mary Francis Carlisle, daughter of Chauncey and Louise (Woodruff) Goodrich of Elmira, New York, who survives him. Died at East Greenwich, Rhode Island on December 27, 1881 of consumption. Julius Henry Waterbury, son of Nathaniel and Louisa (Moore) Waterbury, born at New York, New York on September 25, 1826. Fitted for college at Thetford (Vermont) Academy, then residing at Lyme, New Hampshire. Principal of a private school, Philadelphia, Pennsylvania 1850-51. In Gen. Theological Seminary Protestant Episcopal Church, New York, 1851-54, graduated 1854; ordained deacon 1853; presbyter 1855. Rector at St. Charles, Illinois 1853-56 ; Sycamore, Illinois 1856-57; Elgin, Illinois 1857-59; Marengo, Illinois 1859-62; St. Paul's Church, Winona, Minnesota 1862-66; Christ Church, Cuba, New York 1866-69; Le Roy, New York 1869-72; Greenfield, Massachusetts 1872-74; St. John's Church, East Boston, Massachusetts 1874-78; chaplain at Massachusetts State Prison 1878-81; rector at St. Matthews's Church, Worcester, Massachusetts, 1881-82, till decease. Edited Common Praise, 1866; Children's Praise, 1871. Married at Aurora, Illinois on June 16, 1856, Jane Rebecca, daughter of Richard and Jane (Teasdell) Branford of Batavia, Illinois, who survives him. Died at East Boston, Massachusetts on April 7, 1881 of Bright's disease. Jonathan C. Brown, son of Jonathan and Sally (Fitts) Brown, born at Candia, New Hampshire, on January 19, 1827. Fitted for college at Pembroke Academy (2 years) and Phillips Academy, Andover, Massachusetts (1 year). Taught at Fitchburgh (Massachusetts) Academy, 1853-54; principal at Weymouth (Massachusetts) High School , one term in 1854; do Deerfield (Massachusetts) Academy, in 1855; book-seller and law student at Cincinnati, Ohio, January 1856 to 1858. Invalid at Candia, New Hampshire 1859-60; patient in New Hampshire Asylum for the Insane, at Concord, August 4, 1860 till decease. Unmarried. Died at Concord, New Hampshire on August 18, 1881, of consumption. Augustus Leander Marden, son of Nathan and Harriet (Seavy) Marden, born at Easton, Massachusetts on November 9, 1830. Fitted for college at Blanchard Academy at Pembroke, New Hampshire, then residing at Chichester, New Hampshire. In Union Theological Seminary at New York 1856-59. Preached some months at Cabot, Vermont; supplied Congregational Church at Piermont, New Hampshire from May 1860; ordained pastor May 30, 1861, and continued till decease. Married September 24, 1862, Amelia Deborah, daughter of Isaiah and Katherina (Gangwere) Erdman of Reading, Pennsylvania, who survives him. Died at Piermont, New Hampshire on April 24, 1882 of consumption. Jonathan McDuffee Brewster, son of Daniel and Sarah (McDuffee) Brewster, born at Alton, New Hampshire on November 1, 1835. Fitted for college at New Hampton Literary Institute, then residing in Wolfboro. In N. Hampton Bible Institute 1860-62, graduated July 1862; res. licentiate, Andover Theological Seminary 1862-63. Pastor F. Baptist Church, Springvale, Maine, May 1863 to May 1864; ordained December 1863. In Christian Commission 6 weeks in summer of 1864. Associate Editor Morning Star, Dover, New Hampshire, May 1864 to May 1869. Preached at Fairport, New York, December 1869 to August 1870; then resided at Dover, New Hampshire, writing The Life of William Burr, published in 1871; pastor, North Scituate, Rhode Island September 1871 to March 1875; do Park Street Church, Providence, Rhode Island, till decease. Member ex. board F. Bapt. For. Miss. Soc; trustee Storer College; member F. Bapt. Printing Establ. Pub. 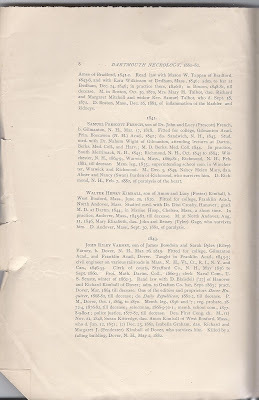 (beside above) History of the Free Baptists of Rhode Island and Vicinity, in Centennial Minutes, 1880; The Freewill Baptists and The Freewill Bapt. For. Miss. Enterprise, in Centennial Record, 1881; left vol. of sermons in MS. Married October 6, 1868, Marilla Marks, daughter of Nichols and Mary (Page) Towle of Danville, New Hampshire, who survives him. Died at Providence, Rhode Island on June 2, 1882 of pneumonia. George Pierce, son of George and Deborah (Knight) Pierce, born at Marblehead, Massachusetts on September 20, 1834. Fitted for college at Topsfield (Massachusetts) Academy. 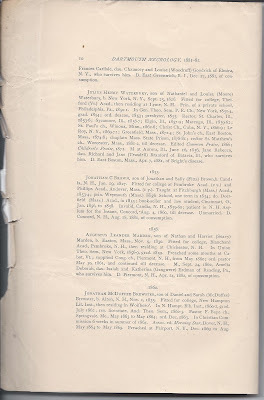 In Andover Theological Seminary 1860-63; ordained pastor at Central Congregational Church, Dracut, Massachusetts on October 14, 1863; dismissed May 6, 1867. 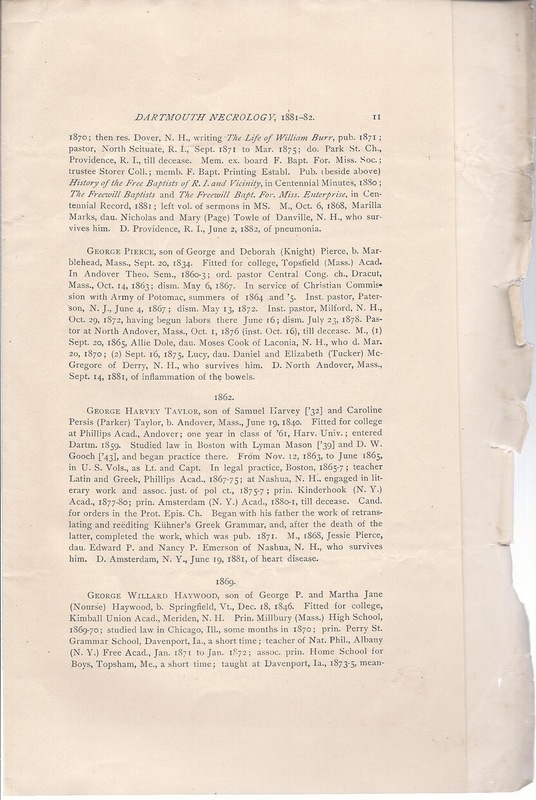 In service of Christian Commission with Army of Potomac, summers of 1865 and 1865. Installed pastor at Paterson, New Jersey June 4, 1867; dismissed May 13, 1872. 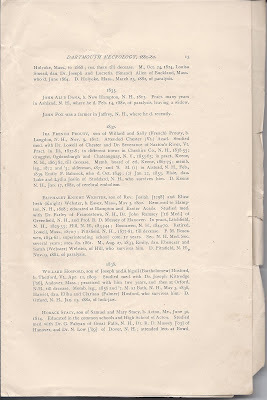 Installed pastor at Milford, New Hampshire October 29, 1872, having begun labors there June 16; dismissed July 23, 1878. Pastor at North Andover, Massachusetts October 1, 1876 (installed October 16) till decease. Married (1) September 20, 1865, Allie Dole, daughter of Moses Cook of Laconia, New Hampshire, who died March 20, 1870; (2) September 16, 1875, Lucy, daughter of Daniel and Elizabeth (Tucker) McGregore of Derry, New Hampshire, who survives him. Died at North Andover, Massachusetts on September 14, 1881 of inflammation of the bowels. George Harvey Taylor, son of Samuel Harvey ['32] and Caroline Persis (Parker) Taylor, born at Andover, Massachusetts on June 19, 1840. Fitted for college at Phillips Academy, Andover; one year in class of '61 at Harvard University; entered Darmouth 1859. Studied law in Boston with Lyman Mason ['39] and D. W. Gooch ['43] and began practice there. 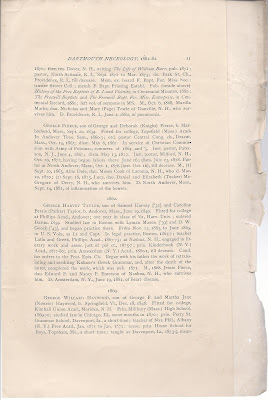 From November 12, 1863 to June 1865, in U. S. Vols as Lt. and Capt. 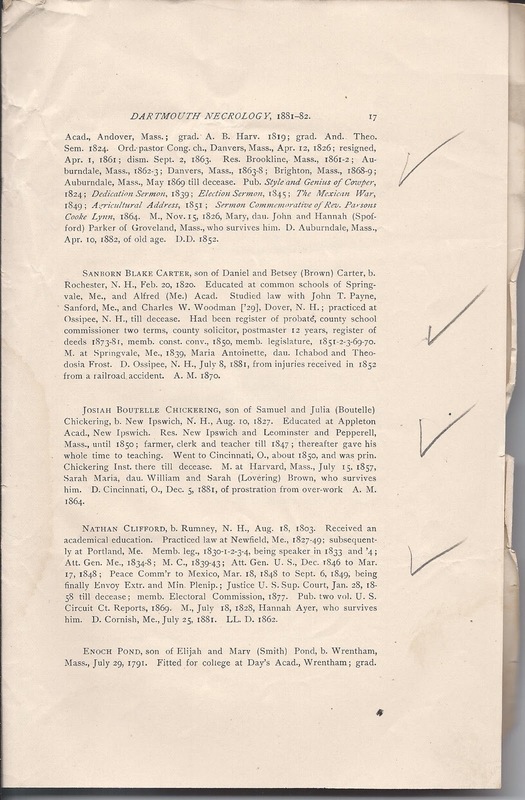 In legal practice, Boston, 1865-67; teacher Latin and Greek, Phillips Academy 1867-75; at Nashua, New Hampshire, engaged in literary work and assoc. just. of pol ct., 1875-77; principal at Kinderhook (New York) Academy, 1877-80; principal at Amsterdam (New York) Academy, 1880-81, till decease. Candidate for orders in the Protestant Episcopal Church. Began with his father the work of retranslating and re-editing Kuhner's Greek Grammar, and, after the death of the latter, completed the work, which was published 1871. Married 1868 Jessie Pierce, daughter of Edward P. and Nancy P. Emerson of Nashua, New Hampshire, who survives him. Died at Amsterdam, New York on June 19, 1881 of heart disease. George Willard Haywood, son of George P. and Martha Jane (Nourse) Haywood, born at Springfield, Vermont on December 18, 1846. Fitted for college, Kimball Union Academy, Meriden, New Hampshire. Principal of Millbury (Massachusetts) High School, 1869-70; studied law in Chicago, Illinois, some months in 1870; principal Perry Street Grammar School, Davenport, Iowa, a short time; teacher of Nat. Phil., Albany (New York) Free Academy, January 1871 to January 1872; associate principal of Home School for Boys, Topsham, Maine, a short time; taught at Davenport, Iowa, 1873-75; meanwhile studying law with Rose & Linsley. In practice at Davenport, Iowa, 1875-81. Jamestown, Dakota, October 1, 1881 to January 1, 1882; Moorhead, Minnesota till decease. Married October 10, 1872, Hetty, daughter of Dr. Peter and Harriet (Platt) Staats of Albany, New York, who survives him. Died at Moorhead, Minnesota on May 3, 1882, of erysipelas, following pneumonia and measles. Thomas Macomber, son of Benjamin and Hannah (Meeker) Macomber, born at Grand Isle, Vermont on May 31, 1847. Fitted for college, at Vermont Conf. Seminary at Montpelier, Vermont. Principal at Lancaster (New Hampshire) Academy, 1874-1881, till decease. Married at Malone, New York, July 27, 1875, Alice M., daughter of Nathaniel and Laura (Page) Wood, who survives him. Died at Lancaster, New Hampshire, June 27, 1881, of erysipelas. Daniel Arthur Rollins, son of Daniel C. and Asenath Estella (Howe) Rollins, born at Methuen, Massachusetts on June 4, 1858. Fitted for college at Methuen High School. Local editor of Lawrence (Massachusetts) Sentinel, September 1st to last of Dec. 1879; Editor and proprietor of Methuen Enterprise and Salem Gleaner, March 1, 1880 to March 11, 1882. Unmarried. Died at Methuen, Massachusetts on March 26, 1882, of hemorrhage of the lungs. Joseph Henry Sanborn, son of Joseph Palmer and Mercy Knight (Woodworth) Sanborn. Born at Somerville, Massachusetts on April 16, 1856. Fitted for college at Somerville High School. 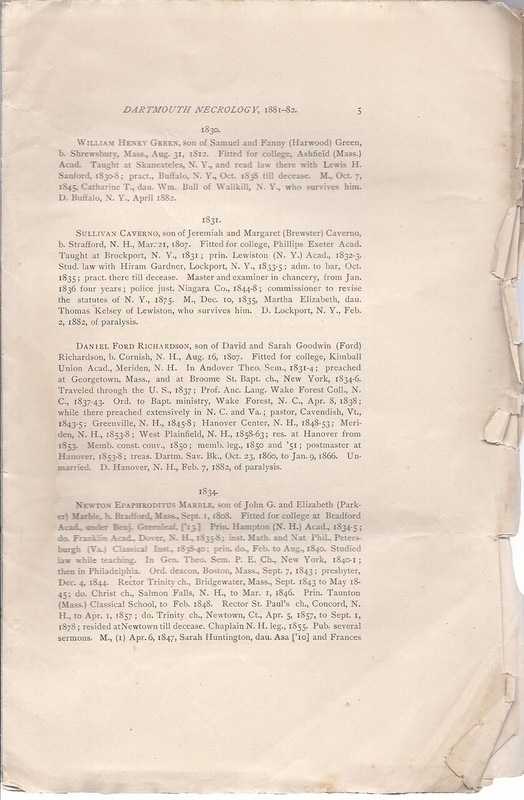 Studied law with N. W. Ladd ['73] of Boston from October 1879. Taught at Dorchester, New Hampshire, in the fall of 1880. Unmarried. Died at East Somerville, Massachusetts, on June 14, 1881, of consumption. Charles Henry Hall, son of Charles Alison and Susan (Webster) Hall, born at Manchester, New Hampshire, on November 13, 1859. Fitted for college at Manchester High School. Died at Manchester, New Hampshire on December 11, 1881 of consumption. Lawson Long, son of Stephen and Nancy (Lawson) Long, born at Shelburne, Massachusetts on February 25, 1798. Studied medicine with Dr. George Winslow. Practiced a short time at Shelburne Falls, Massachusetts; Buckland, Massachusetts 1823-1831; North Adams, Massachusetts, 1831 to January 1836; Shelburne Falls, Massachusetts to April 1845; Holyoke, Massachusetts to 1868; resided there till decease. Married October 24, 1824, Louisa Smead, daughter of Dr. Joseph and Lucretia (Smead) Allen of Buckland, Massachusetts, who died June 1864. Dr. Long died at Holyoke, Massachusetts on March 23, 1882 of paralysis. John Alid Dana, born in New Hampton, New Hampshire in 1813. Practiced many years in Ashland, New Hampshire, where he died February 14, 1882 of paralysis, leaving a widow. John Fox was a farmer in Jaffrey, New Hampshire, where he died recently. Ira French Prouty, son of Willard and Sally (French) Prouty, born at Langdon, New Hampshire on November 9, 1812. Attended Chester (Vermont) Academy. Studied medicine with Dr. Lowell of Chester and Dr. Severance of Saxton's River, Vermont. Practiced in Illinois 1837-38; in different towns in Cheshire County, New Hampshire 1838-1855; druggist at Ogdensburgh and Chateauguay, New York 1855-1863; in practice at Keene, New Hampshire 1863-1882, till decease. Member board of education at Keene, New Hampshire 1867-1875; member of the legislature 1872 and 1873; alderman 1877 and 1878. Married (1) in Alstead, New Hampshire, February 1839, Emily F. Babcock, who died October 1849; (2) January 22, 1855, Elsie, daughter of Luke and Lydia Joslin of Stoddard, New Hampshire, who survives him. Died at Keene, New Hampshire on January 17, 1882 of cerebral embolism. Eliphalet Knight Webster, son of Rev. Josiah  and Elizabeth (Knight) Webster, born at Essex, Massachusetts on May 3, 1802. 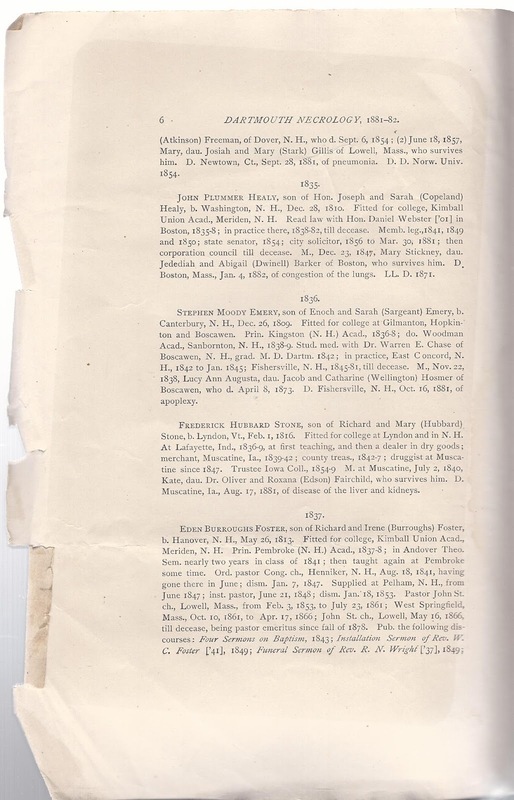 Removed to Hampton, New Hampshire 1808; educated at Hampton and Exeter Acads. Studied medicine with Dr. Farley of Francestown, New Hampshire; Dr. John Ramsey ['16 Med.] 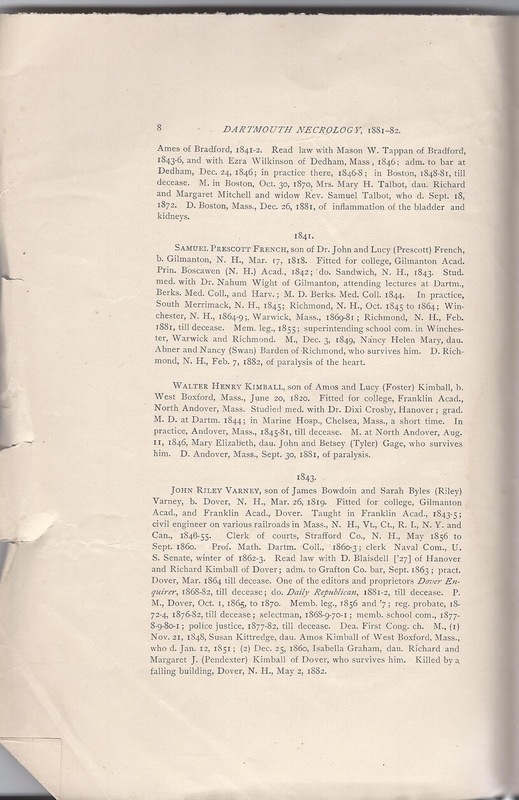 of Greenfield, New Hampshire, and Prof. R. D. Mussey of Hanover. In practice at Litchfield, New Hampshire 1829-1833; Hill, New Hampshire 1833-44; Boscawen, New Hampshire 1844-1870. Retired to Lowell, Massachusetts 1870-1877; Pittsfield, New Hampshire 1877-1881, till decease. 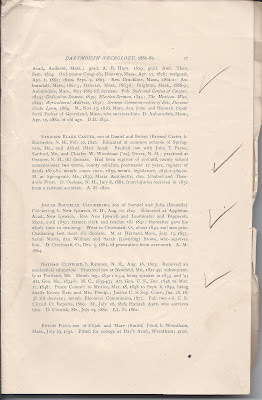 Postmaster at Boscawen, New Hampshire 1854-1862; superintending school committee 12 years. Sec. New Hampshire Medical Society several years; president of same 1861. Married August 27, 1833, Emily, daughter of Ebenezer and Sarah (Webster) Webster, of Hill, who survives him. Died at Pittsfield, New Hampshire on November 9, 1881, of paralysis. Willard Hosford, son of Joseph and Abigail (Bartholomew) Hosford, born at Thetford, Vermont on April 11, 1805. Studied medicine with Dr. Joseph Kittredge ['06], at Andover, Massachusetts; practiced with him two years and then at Orford, New Hampshire, till decease. Member Legislature 1856 and 1857. Married at Bath, New Hampshire on May 3, 1838, Harriet, daughter of Elihu and Clarissa (Palmer) Hosford, who survives him. Died at Orford, New Hampshire, on January 15, 1882 of lock-jaw. Horace Stacy, son of Samuel and Mary Stacy, born at Acton, Maine, on June 30, 1814. Educated in the common schools and High School of Acton. Studied medicine with Dr. G. Fabyan of Great Falls, New Hampshire, Dr. R. D. Mussey ['03] of Hanover, and Dr. N. Low ['09] of Dover, New Hampshire; attended lectures at Bowdoin and Dartmouth, and at Jefferson Medical College. In practice at Eliot, Maine, 1838-44; Boston, Massachusetts 1844-1882, till decease. Married October 17, 1839 at Eliot, Sarah Jane, daughter of Moses and Mary Paul, who survives him. Died at South Boston, Massachusetts on May 5, 1882 of old age. Charles Frederick Adams, practicing medicine at Rutland, Vermont, previously to 1877; was thereafter a patient in Dr. Russell's private insane asylum at Winchendon, Massachusetts, where he died Feburary 10, 1881, aged 63. James Ephraim Morse, son of John A. and Sally (White) Morse, born at Craftsbury, Vermont on April 12, 1824. Attended Peacham (Vermont) Academy; taught in Ohio, 1845-48. 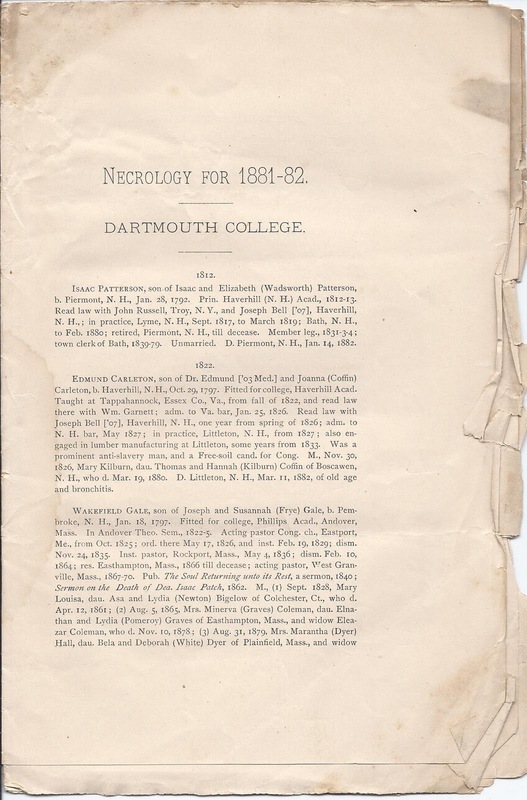 Studied medicine with Dr. Brown of Hartford, Vermont, attending lectures at Woodstock and Dartmouth. In practice, Felchville, Vermont, one year from fall of 1849; West Hartford, Vermont 1850-1865; Royalton, Vermont, October 1865 till decease. Married (1) about 1849, Celestia A., daughter of Russell and Mary (Richardson) Smith of Hanover, New Hampshire, who died August 26, 1865; (2) August 25, 1867, Martha J. daughter of William E. and Annie (Briggs) Brockway of Hartford, Vermont, who survives him. Died at Royalton, Vermont on May 14, 1882, of cerebral meningitis. William Henry Martin, son of Caleb and Polly (Whitney) Martin, born at Goffstown, New Hampshire on December 6, 1823. Attended Pembroke (New Hampshire) Academy. Studied medicine with Dr. Little of Goffstown and Dr. Bunton of Manchester, New Hampshire. In practice at Londonderry, New Hampshire 1851-57; in Kansas, 1857-58; Waterloo, Wisconsin, a year and a half; Godfrey, Illinois, 1860-82, till decease. Married March 22, 1851, at Concord, New Hampshire, Mary F., daughter of William and Fanny (Leach) Taylor, who survives him. Died at Godfrey, Illinois on March 1, 1882, of disease of the kidneys and bladder. Mills Olcott Heydock, son of William Townsend ['19] and Jane Eliza (Olcott) Heydock, born at Hanover, New Hampshire on February 4, 1828. Fitted for college at Moor's Charity School, Hanover, New Hampshire. Clerk, Concord, New Hampshire, some time. Studied medicine with Dr. Dixi Crosby, Hanover, 1849-1852; in practice, Farmington, Connecticut 1852-55; Chicago,Illinois 1855-1881, till decease. Trustee and medical visitor St. Luke's Hospital from its foundation; Prof. Med. Jur. Chic. Med. College, 1863-65; Professor Mat. Med. and Therap. do, 1865-1870. Married Harriet Wells Cowles of Farmington, Connecticut, who survives him. Died at Chicago, Illinois on April 17, 1881, of heart disease. Abner Augustus Doty, son of Abner and Betsey (Putnam) Doty, born at Elmore, Vermont on March 15, 1828. Attended Morrisville, Bakersfield and Newbury Academies. Studied medicine with Dr. W. H. Carter ['49 Med.] of Newbury, Vermont; in practice at Newbury, October 1853 till fall of 1855; Bradford, Vermont till decease. Married at Newbury, October 29, 1853, Susan Ellen, daughter of Dr. William Henry and H. H. Carter, who survives him. Died at Bradford, Vermont on February 17, 1882 of consumption. Homer Hopson Tenney, son of Harper and Cynthia (Marsh) Tenney, born at Randolph, Vermont on July 21, 1826. Educated in common schools of Hartford, Vermont, and high school of Newbury, Vermont. Studied medicine with Dr. E. V. Watkins ['50 Med. 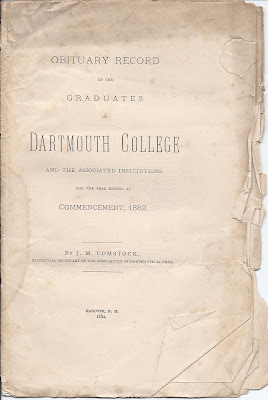 ], at Newbury, Vermont, attending lectures at Woodstock and Dartmouth. In practice at Haverhill, New Hampshire November 1855 to 1866; Lawrence, Kansas, to November 1869; Centralia, Kansas, to fall of 1872; Irving, Kansas, till decease. Volunteer Surgeon, U. S. A., a few weeks in summer of 1869. Married at Haverhill, New Hampshire, June 12, 1857, Sarah A., daughter of George W. and Susan (Atkinson) Johnson, who survives him. Died at Irving, Kansas, on September 1, 1881, of cholera morbus. Benjamin Franklin Eaton, son of John and Sarah L. Eaton, born at Grantham, New Hampshire on November 9, 1831. Attended Kimball Union Academy at Meriden, New Hampshire 1848-51. 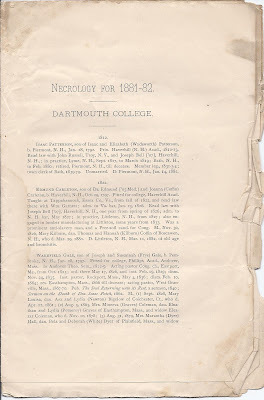 Studied medicine one year with Dr. John Baker of Meriden, and one year with Dr. Luther C. Bean of Lebanon, New Hampshire; attended lectures during this time at Woodstock Medical College. Clerk in drug-store of Dr. . A. Smith ['49 Med.] at Hanover about 6 years. Hospital steward 1st Reg N. H. Volunteers 3 months in 1861; then assistant and acting surgeon of 3rd New Hampshire Volunteers to 1863. In practice, Barnet, Vermont, 1863-69; druggist, Hartford, Vermont, 1869-1871; in practice there 1871-1882, till decease. Married (1) August 1861 at Hanover, Sarah A. daughter of William P. and Sarah Barker of Bellows Falls, Vermont, who died August 19, 1869; (2) June 7, 1872, at Hartford, M. Etta, daughter of Abraham and Mary B. Hopkins of Grantham, New Hampshire, who survives him. Died at Hartford, Vermont on March 2, 1882 of typhoid pneumonia. Isaac Smith, son of Rev. Isaac and Angeline (Macomber) Smith, born at East Stoughton, Massachusetts on December 9, 1841. Educated at Foxboro and at Attleboro and Middleboro Academies, Massachusetts. Studied medicine with Dr. S. S. Gifford of East Stoughton. Surgeon U.S. 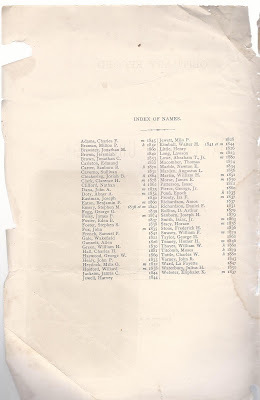 Volunteers from December 1862 to November 7, 1864, being some time surgeon in charge of the U. S. A. General Hospital at New Orleans. In practice at Fall River, Massachusetts 1864-1882, till decease. 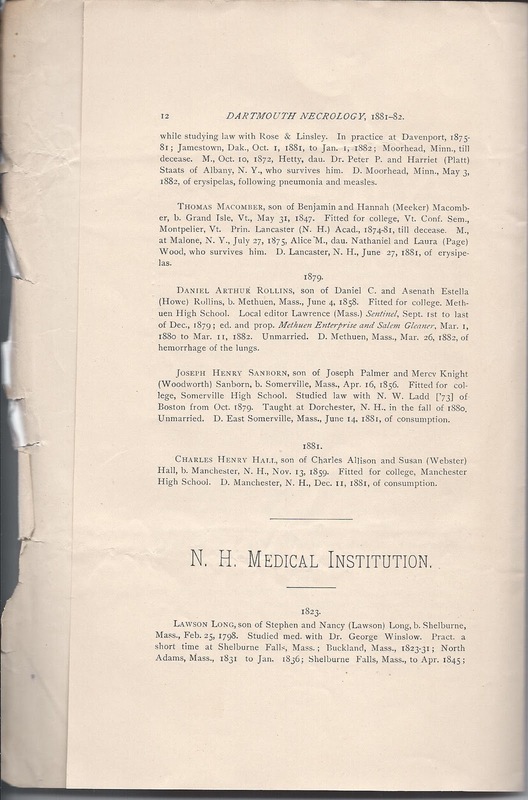 City physician, January 17 to May 30, 1871; Professor of Clin. and Oper. Surg. Coll, Phys. 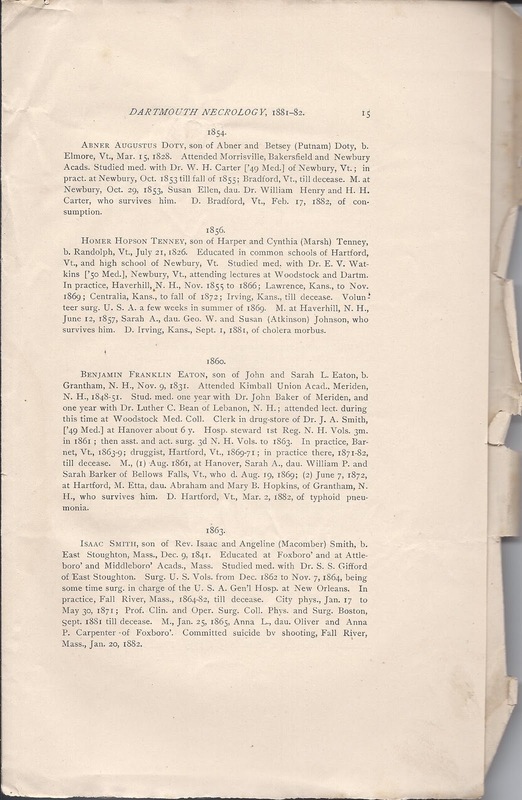 and Surg., Boston, September 1881 till decease. Married January 25, 1865, Anna L., daughter of Oliver and Anna P. Carpenter of Foxboro. Committed suicide by shooting, at Fall River, Massachusetts on January 20, 1882. James Purcell Foley, son of Cornelius and Catherine (Connors) Foley, born at Saco, Maine, on September 8, 1840. Student at St. Charles College at Montreal, 1856-1859; subsequently at St. Mary's College, Baltimore and Holy Cross College, Worcester, Massachusetts. Studied some time for the Roman Catholic priesthood at St. Joseph's Provincial Seminary, Troy, New York, and then medicine at Harvard and Dartmouth. In practice at Fitchburgh, Massachusetts 1874-1881, till decease. Married at Utica, N ew York on April 28, 1873, Mary Elizabeth, daughter of Hugh and Mary (Bryan) Callanen, who survives him. Died at Fitchburgh, Massachusetts on September 18, 1881, of cerebrospinal meningitis. Clarence Howe Clark, son of Moses and Martha P. (Rowell) Clark, born at Newbury, Vermont on June 22, 1855. Educated at Bradford Academy and Newbury Seminary. Studied medicine with Dr. E. V. Watkins ['50 Med.] 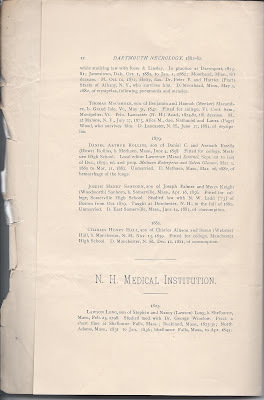 of Newbury, at Darmouth and at Bishop's Medical College and McGill's Hospital, Montreal, Quebec; in practice at Haverhill, New Hamsphire, 1878-1880; at Newbury, Vermont some months in 1881; resided at Newbury till decease. Unmarried. Died at Newbury, Vermont on March 14, 1882, of consumption. William Franklin Swasey, son of Isaac and Emeline (Hall) Swasey, born at Norwich, Vermont, on May 6, 1855. Educated at Norwich and Royalton (Vermont) Academies. 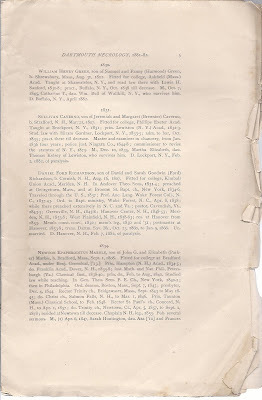 Attended lecture and recitation terms at Hanover 1876-1878. In practice at Truro, Massachusetts November 19, 1878 to May 12, 1880; West Medway, Massachusetts to December 1880; then at Truro till decease. Married at Royalton, Vermont on November 13, 1878, S. Loie, daughter of John W. and Hattie V. Metcalf of Royalton, who survives him. Died at Truro, Massachusetts on December 18, 1881, of organic disease of the heart. Abraham Thompson Lowe, son of Dr. Abraham Thompson ['16 Med.] and Eliza B. Lowe, born at Bridgewater, Massachusetts on February 20, 1857. Fitted for college at Chauncy Hall School, Boston; graduated A. B. Boston University 1877. Studied medicine one year at Harvard; two terms at Dartmouth; one term at Jefferson Medical College, Philadelphia; 4 or 5 months with Dr. William Read ['39], Boston, and was at Boston City Hospital about 6 months. Was about to begin practice. Unmarried. Died at Boston, Massachusetts on August 18, 1881, of heart disease. William Withington Thayer, son of William and Sarah (Whitcomb) Thayer, born at Thetford, Vermont on June 3, 1809. Educated at Thetford Academy and Bangor (Maine) Classical Institute, 1832-34; graduated Bangor Theological Seminary 1837. Received appointment as missionary A. B. C. F. M., but poor health prevented entering upon the work. Ordained to Congregational ministry, Orono, Maine on March 21, 1839; pastor there till October 9, 1839; do South Hadley Canal, Massachusetts, December 4, 1839, to March 29, 1842; home missionary in Wisconsin, 1843-44; acting pastor South Deerfield, Massachusetts,1845; pastor at Lyndon, Vermont, January 21, 1846 to January 20, 1852; resided St. Johnsbury, Vermont 1852-1881, till decease; connected some time with home missionary work in Vermont; librarian at St. Johnsbury Athenaeum, 1870-1880. Married (1) March 21, 1839, Elizabeth, daughter of Daniel Garland of Bangor, Maine, who died January 21, 1845; (2) March 4, 1847, Charlotte, daughter of Ephraim and Abby (Phelps) Paddock of St. Johnsbury, Vermont, who died June 26, 1855; (3) September 4, 1857, Mrs. Almira (Taylor) Fairbanks, daughter of James and Persis (Hemphill) Taylor of Windham, New Hampshire, and widow of Joseph Fairbanks of St. Johnsbury; she survives him. He died at St. Johnsbury, Vermont on December 11, 1881, of acute bronchitis. A.M. 1860.